Chief Kathleen O’Toole was sworn in as Chief of the Seattle Police Department on June 23rd, 2014. She is a career police officer and lawyer who has earned an international reputation for her principled leadership and reform strategies. In 2012, she completed a six-year term as Chief Inspector of the Gardia Síochána Inspectorate, an oversight body responsible for bringing reform, best practice, and accountability to the 17,000 member Irish national police service. During her police career, she was assigned to numerous patrol, investigative, undercover, supervisory, and management positions. Dr. Gita Bangera is currently Dean of Undergraduate Research at Bellevue College building the new division, RISE Learning Institute, focused on bringing Research, Innovation, Service and Experiential Learning to courses across Bellevue College. She was selected in a national search to be one of 39 Partnership for Undergraduate Life Science Education leadership fellows impacting science education at the national level. She is the director of the ComGen project bringing in over $1M in funding from the National Science Foundation to Bellevue College. She is also Adjunct Professor at Washington State University, and an inventor and technical consultant for Intellectual Ventures with over 75 patent applications. She is also currently working on opening a high-end Indian restaurant in Pioneer Square in Spring 2015. Linda De Boldt is the Public Works director for the City of Redmond. She served as the deputy director and chief engineer for Seattle Public Utilities in the project delivery branch and has served the City of Seattle for close to 30 years. Her experience includes transportation, utilities, natural resource preservation and restoration, public works management, strategic planning and organization development. Srilakshmi Remala launched Remala Consulting LLC to provide technology and management consulting for the education and non-profit sector. Her experience spans the private, public, and nonprofit sectors and has focused on building systems and capacity for growing organizations, including at Microsoft and the Bill & Melinda Gates Foundation. She specializes in User Experience and Digital Strategy and has designed and launched high-profile online experiences. Cheryl Paston is a licensed Professional Engineer and has worked in Public Works for over 27 years, primarily on drainage and wastewater utilities. She is currently the Deputy Public Works Director for the City of Sammamish and is responsible for establishing stakeholder partnerships; collaborating with the Department Director and City leadership to establish priorities, policies and strategic direction; leading development and implementation of key department initiatives including Asset Management; and oversees the Traffic and Stormwater Program Planning, Administrative and Maintenance and Operations staff. Cheryl previously worked for Seattle Public Utilities as Combined Sewer Overflow/Wastewater Capital Projects Delivery Manager, and was responsible for the delivery of $500M in projects. Kim Pastega was named vice president of Production System Operations for the Boeing 787 Dreamliner in October 2013. She leads the team responsible for implementing a comprehensive operations plan for assembling 787s. Additionally, she is focused on stabilizing the 787 design and the global production system to allow the accomplishment of productivity and efficiency goals. She is charged with ensuring the 787 deploys lean principles across the extended global supply chain, improves efficiency, and drives greater profitability. Beginning in 2010, Pastega served in the position of vice president and general manager of the 767 program with responsibility for all aspects of the business including overall operational, engineering and financial performance. Michelle Mills Clement, a native of Chicago, joined the Commercial Brokers Association (CBA) as their Executive Director and CEO in May 2014 where she oversees the strategic direction of the 3,800 member organization. Headquartered in Kirkland, Washington with a staff of 17, CBA is a member-owned cooperative association providing commercial real estate multiple listing services to its members since 1977. Stephanie Caldwell is the Small Business Program Manager for Absher Construction Company, and has worked in the construction industry for 16 years. She joined Absher as a Project Assistant in 1998 at the $67M New Holly Redevelopment project, where she worked to implement the project’s HUD Section 3 hiring program for community residents. Stephanie continues to work with organizations in helping them to develop and implement their project-specific community plans. She works with community-based organizations like the William M. Factory Small-Business Incubator, National Association of Minority Contractors– Washington Chapter, Snohomish County Economic Development Council – PTAC program, and the Seattle Vocational Institute Pre-Apprenticeship Construction Training to help bridge the gap with project-specific community outreach requirements. Kelly Knebel emigrated from South Korea to the United States when she was 17. “That first flight was long, uncomfortable, turbulent, and unforgettable… and I knew right away I wanted to pursue a career in aviation! Growing up in Korea, the only option in aviation was to be a flight attendant – female pilots were unheard of.” After learning English she left college to work for a major airline as a flight attendant. What she enjoyed most was spending time in the flight deck learning about airplanes during the long international flights. She returned to college, completing flight certificates and ratings and degree while still working as a flight attendant. After graduating with honors in Aerospace Science, she accumulated flight hours by instructing, and then worked for a small commuter airline becoming a captain and a check airman. In 2006 she landed her dream job when she was hired by Alaska Airlines. She is a board member for the International Society of Women Airline Pilots, a non-profit organization that provides scholarships and mentoring. Dr. Joyce Yen, Ph.D., is the Program/Research Manager for the UW ADVANCE Center for Institutional Change. Dr. 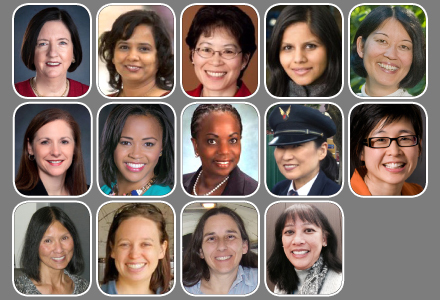 Yen has been PI or co-investigator on ten successful proposals that have brought over $4.5 million in funding to advance women faculty in science, engineering, and mathematics; to address faculty professional development more generally; and to diversify science and engineering and create a more inclusive climate in engineering. Shira Broschat is a professor in the School of Electrical Engineering and Computer Science and adjunct faculty in the Paul G. Allen School for Global Animal Health and in the Department of Veterinary Microbiology and Pathology at Washington State University. Broschat believes that for the U.S. to remain competitive in the global economy it must have a diverse engineering and computing workforce. For her research, she and her team of computer science undergraduate and graduate students work with microbiologists to explore problems related to antibiotic resistance, infectious diseases, and bacterial pathogens. Broschat is a Fellow of the Institute of Electrical and Electronics Engineers, the Institute of Physics, and the Acoustical Society of America. Dr. Melissa Rice is an Assistant Professor of Planetary Science at Western Washington University, where she teaches in the Geology Department and the Physics & Astronomy Department. Her research focuses on the sedimentology, stratigraphy and mineralogy of planetary surfaces; the current aim of her work is to help constrain the habitability of ancient environments on Mars. She is a collaborator on the active NASA Mars Science Laboratory Curiosity and Mars Exploration Rover Opportunity missions. Dr. Rice received her Ph.D. in the Department of Astronomy at Cornell University. She was a Postdoctoral Scholar in the Division of Geological and Planetary Sciences at the California Institute of Technology. Dawn Gidner is a member of the Sault Ste Marie Tribe of Chippewa Indians. Although she did not grow up on a reservation she always felt a strong affinity for the tribe and its culture. She earned a degree in an agricultural field from the Pennsylvania State University in 1979. She arned an MSEE at the University of Washington in 2002. Since 2002, she has worked at Honeywell Aerospace as a radar systems engineer, where she is involved in many aspects of Honeywell’s airborne weather radar systems and other avionics. She is currently co-chair of an industry-wide committee working with the FAA to revise the certification standards for airborne weather radar systems. Tina Soike, Director of Engineering Services, has 35 years experience with the Port of Seattle’s capital program. She’s held various positions within Engineering, Project Management, and Airport Operations. Her current responsibilities encompass engineering design services, survey and mapping, construction management and construction safety. Tina holds a Bachelor of Science degree in Civil Engineering from the University of Washington. There will be a raffle for two tickets from Alaska Airlines, valued at $2500. For reservations, email RSVP@nwasianweekly.com, or call 206-223-0623. To purchase tickets online, please go to http://www.brownpapertickets.com/event/1224559.